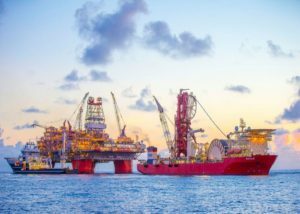 HOUSTON – BP recently started up the Thunder Horse South Expansion project in the deepwater Gulf of Mexico 11 months ahead of schedule and $150 million under budget. The operator said that the project is expected to boost production at the facility by an estimated 50,000 boe (gross), further increasing output at what is claims is one of the largest oil fields in the Gulf of Mexico. Planned for 2017, it was brought online on Dec. 8, 2016. BP CEO Bob Dudley said: “Thunder Horse South Expansion – along with our recent approval of the $9-billion Mad Dog Phase 2 platform – demonstrates that the US Gulf of Mexico remains a key part of our global portfolio today and for many years to come. Developed with partner ExxonMobil, the Thunder Horse platform sits in more than 6,000 ft (1,829 m) of water and began production in June 2008. It has the capacity to handle 250,000 b/d of oil and 200 MMcf/d (gross) of natural gas. The facility continued to operate during construction and installation of the new subsea production and pipeline system. Discovered in 1999, Thunder Horse is one of the operator’s largest discoveries in the Gulf of Mexico to date. BP holds 75% working interest and the operatorship in the project, with ExxonMobil holding the remaining 25%. Between 2013 and 2016, BP said its average daily production in the US Gulf of Mexico increased from 189,000 boe to 264,000 boe. 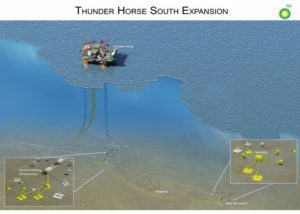 Last year it started up a major water injection project at Thunder Horse that will allow for the recovery of an additional 65 MMboe and approved the $9-billion Mad Dog Phase 2 project, expected to come online in late 2021.